The Sierra Madre Tattler! : Many Cry Out - Has the Wistaria Festival Been Canceled? Many Cry Out - Has the Wistaria Festival Been Canceled? As we all believed we knew, this Sunday's Wistaria Festival is not only on, but it is also receiving the full favor of every possible media exposure available. That being from newspapers to the many options offered to us by the Internet. Even the World's Largest Flowering Plant has been doing its part by, well, flowering. All 250 tons of that lovable big purple dude. Certainly this multi-media publicity blitz has been capturing the attention of many. 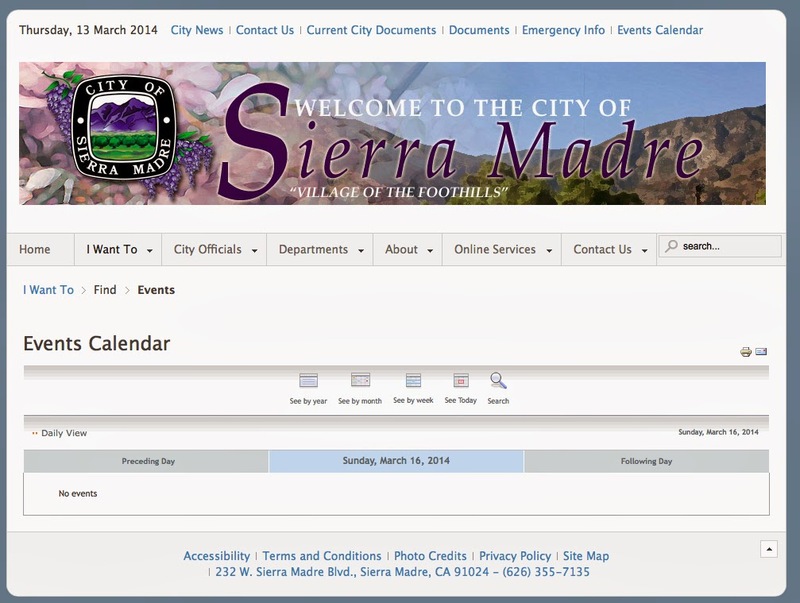 However, according to the City of Sierra Madre website there are no events scheduled for this Sunday. The above screenshot was taken yesterday afternoon, and as you can see it clearly states that there is nothing going on in Sierra Madre that day. Not even a child's birthday party at Memorial Park. It is easy to realize that people checking the City's website for Wistaria Festival information might come away with the wrong impression. Especially those from out of town. We folks in the know understand that the Wistaria Festival is still happening, and that what we are seeing on the City of Sierra Madre website must be the product of a lack of concentration, or something. I suspect that they believe Measure UUT is a much bigger event for them, and that the community's evident opposition to it has been more than a little distracting for the inmates of City Hall. Let's hope the City gets its focus back soon. Though they might believe otherwise, it isn't really all about them. As we discussed just the other day, half of the town recently received the rather propagandistic and inappropriately titled "UUT Factsheet" in the mail along with their water bill. The distribution of a political point of view held by the City, at resident expense and on a tax question that will be on the ballot in a couple of weeks, is about as bad as it gets. The authorities have been notified and we patiently await their decision on this rather egregious violation of state election law. That said, I received the following remarks from an especially sharp-eyed reader, and I thought I should share them with you today. In the badly misnamed "UUT Fact Sheet" on page 5 it states: "In total, since 2008, the City has reduced staffing by almost 10 full-time equivalent employees. (There are currently 63 full-time employees.)" Where I come from, 68-64 = 4, not "almost 10". As has become very obvious, City Hall will say just about anything to get your dough. So much so that they are starting to look desperate. I wasn't there because I wasn't even in the same state as you are right now. I was traveling on business and just couldn't make it this year. It is now very late, I'm back home, and working on my blog addiction. That said, there were two late evening comments here on The Tattler that I thought I should highlight for you, both dealing with the festering dishonesty coming from the pro-UUT side of the debate. If the Sheriffs were brought in their local station would be situated in the exact same place the SMPD is housed right now. And response times would be exactly the same. Gene and Noah are just pandering here, and not in an even remotely believable way. They need to look ashamed. I personally doubt that the residents will allow the City to bring in the Sheriffs, and the SMPD will still be with us after Measure UUT fails. That said, sunsetting our state leading double-digit UUT next year will put us in a much better bargaining position with the SMPOA, and the benefit package and pension plan grab they're dreaming about will vanish into thin air. And that is a good thing. Anyone in the PD who doesn't like it is more than free to seek employment elsewhere. It's a free country. Enough with the whining already. Arcadia, Sierra Madre in water fight over Raymond Basin boundaries - Amid worries about rust-infused water and prolonged drought, Sierra Madre on Thursday accused Arcadia of stealing water from a shared East Raymond Basin. Holly Whatley, Sierra Madre’s assistant city attorney, said the California Supreme Court divided the east and west Raymond Basin in a 1944 judgment, and the Raymond Basin Management Board must abide by the 70-year-old decision. Maybe Arcadia has to steal our water to supply all of those McMansions they've allowed to be built there? Click here for the rest of Zen's article. I was at the Woman's Club Candidate Forum last night and could not believe what Goss and Green were saying about the Sheriff coming from the Temple City Station. Was going to say something but did not want to be disruptive and kept my mouth shut. Only someone who was being prompted on what to say would say that. Any self thinker would not come up with that line, a line meant to strike fear in people, a line so untrue I can't believe these two guys would repeat it. What does this tell me? It tell me these 2 will say what ever they are told to say and neither should be leading our city. I will be speaking up in the future. This just boggles the mind that they could say that with a straight face, guess they really believe that. Again, did a SMPD car have an accident trying to make good time to a response?? I haven't tried it but this is a small town, think you can make it from one end to the next in 3 min just driving normal speed, really. Did anyone speak up? Any of the other candidates? Or did the people who attended leave with the wrong information? throwing out cow poop - Goss can do this quite readily. remember he was raised on a cattle ranch on northern Oregon. Red herrings, canards and deception. All the earmarks of a Doyle run campaign. Gene Goss and Noah Pants pandering to the fears of low information Sierra Madre voters? Naw. Why would they ever want to employ the same dishonest tactics as every other wannabe clone councilman cooked in Bart Doyle's easy bake oven? They're just puppets. Put your pants on, Noah. Sierra Madre - Arcadia water war. Just like in the olden days. Lucky Baldwin & NC Carter are laughing, somewhere. The Pro-UUT campaign being led by Bart Doyle with his mouth piece Nancy Walsh is a CYA for his past work. Now we have his two boys Green and Goss spreading more of his lies about the Sheriff's Department responding from the Temple City Station. What CYA are these 2 going to say at the next forum to cover up their last stupid statement? The problem for those knuckleheads is they have so much of that to cover. I would have been OK with the Sheriffs until all of the Lee Baca - Paul Tanaka stuff came out. I'm OK with the SMPD being put on a much shorter financial leash. If they don't like it? Yo later, dude. I think the Bartlings big Machiavellian move here is they throw out some obvious stupidity about the Sheriffs, and we then all go and defend them. We should keep the SMPD, but cut the money we spend. I'm sure its all been coordinated. Look for something about the Sheriffs vs. SMPD in this week's edition of the Looney Views Lie. Any fool can balance a budget if they can continue to get more money. It takes someone with knowledge and skill to balance a budget and provide adequate services without placing an undue burden on the tax payer. I don't think Goss or Green have the knowlede and skills needed. They'll just bobble their heads like Nancy and Josh do. One of the things that irked me about Tuesday's council meeting, and yet was very telling, was when the council voted 3 - 2 to create a resolution to give commercial high water users a break on their UUT taxes. when asked why they would do that Mayor Walsh replied "because we can". What arrogance! That's vintage Walsh. Tyranny of the surly and petty. It was so nice of Mr. Goss to list his endorsements on the back of his campaign brochure. Most of those listed are Doyle followers and cant think for themselves. When you go down that list you see the names of the people that over the years have put Sierra Madre in the mess we are in right now. The problems Sierra Madre is having is the results of big money from the building / real-estate industry led by a building trade attorney, Bad Bart Doyle. Maybe on his next postcard Goss can list all of bart's many failures. 1) The billion dollar bus station in El Monte. 2) The 2003 interest payment only water bonds. 3) The Downtown Specific Plan. Nothing but lose lose lose with this guy. Makes sense he's in with Goss and Noah Pants. Bart is smarter than we are. No, really! Saw Arizimendi's endorcements on her card. Not one from Sierra Madre. At least she hasn't posted pictures of herself on Facebook assaulting a mannequin. Don't tell those 2 "knuckleheads" what is wrong with what they're saying. Anyone with common sense can see through that stupidity, so let them keep saying stupid things. It certainly does show the low regard the Doylies hold the average Sierra Madre voter in. it's a new day Tattlers and a "NO on UUT" yard sign would look great in your yard. Just let the Mod know you want one. Gotta keep Nancy Fancy pants and Noah no pants on their toes! 6:45, 6:51, you are both right. I think what we need is a citizens oversight committee. This committee could evaluate value for money spent on our police and fire. I think that our FD will come out looking very good. There are some professionals here in town who would be good to have on that committee. Local professionals that are looking out for both our money and safety would be producing no BS. What good is an oversight committee if the money has already been spent? It validates the spends. Then if anyone questions them the City Mangler can say: "The UUT Oversight Committee reviewed it and said everything is OK."
The proposal that came in from the Sheriff's Dept. about 5 years ago stated that they would be dispatched from the Temple City or La Canada station. If we wanted them to man our facility it would cost quite a bit extra. So, while Goss and Green were right in a way, The Council decided we could do with local cheaper and better. One of Goss' big points was that he really liked having the home town police because they were our guys and we know them. Well, I've got news for Gene, the police dept. has been utilizing "960" police for quite some time now. These are police officers that work in the LAPD and on their time off come over to Sierra Madre to work. We get really well trained/experienced officers and we don't pay benefits for them. Also, they rotate around so different officers are here all the time - they are not "our guys". Really, Goss needs to do his homework or he needs to quit lying - something he is able to do quite glibly. Nah, Noah Pants and Tax'em Goss aren't right. The "proposal" wasn't to Sierra Madre specs. It was the free proposal that didn't specify staffing the SM Police Station, etc, etc. Apples and oranges. However, that was how John Buchanan and his ilk deep-sixed it. Altadena has their own station. Based on Goss' lies from last night, those deputies answer calls from Temple City. Give me a break, Goose. What's with this silly fetish some your viewers have in defense of these pathetic amateurish "want to be" police persons,when we have available the service of properly trained professionals available to us through the County.Of course,it would add another step for the City to deal with rather than the cozy one they currently enjoy with he local constabulary. It is a leap a lot of people are afraid to make. Let's keep SMPD. That way the City can keep getting sued directly. Wait a minute. Let's suppose the Sheriff does not take the police station because teh City decides to keep it and convert it into a police museum akin to Wyatt Earp's office. And let's suppose the applicable substation is in San Pedro. Who cares? Don't those police dudes do their patrol work driving around their assigned territory in these contraptions called "cars"? And aren't they dispatched using this contraption called a "phone"? Ergo response time is determined by the area patrolled - in this case about 2 square miles - and not by the name painted on the car, where it is parked at night, or who is financially responsible for their unfunded pension liability? Which brings us to the fundamenatal question: Why does a town with low crime, and certainly non preventable by our goofy police force, insist on overspending by $1.5 million a year for police services? I am beginning to wonder if we are truly a town filled with dopes. PS: Please note I have not used the new F word - fat - so please post. Don't be a fat head. Any deal with the Sheriffs would have to include them having a station here. One of the things that would make us desirable to the sheriffs is that they could have an outpost here - it's not just Serra Madre they want to be able to get around in quickly. The existing building is a decided advantage for them, and should it ever come to real negotiations, I hope the Sierra Madre side will remember that. When City Hall writes up the contract for the SD they can state what ever they want. Good news is that the SMPD members should want to join the SD. More activity, more places to work and more money. Our officers could be written into the contract guaranteeing them a job. That simple thank you. Will the LASD remember the Wistaria Festival? Yes, City Hall can write anything they want into a contract. However, they have to pay for what they get. Excuse me, but why is everyone (or maybe it is one or two posters) so hot over the Sheriff's Dept? In the long run, they will not save any money. Talk to all 4 candidates, and the current council, and you'll see that none think we should have the Sheriff. If you are just trying to discredit Goss and Green, there are Plenty of other areas to pick on, such as Green's trying to capitalize on the water idea when he doesn't know what he is talking about. I agree. Stop Measure UUT and then renegotiate the PD's contract with the city. In the end they'll work for less because where else can they go? IF the LASD takes over, as 08:45 said, it WOULD BE patrolled by either Temple City Sheriff (TEM) or Crescenta Valley Sheriff (CVS). LASD WOULD also respond from their respective stations/areas. The most likely scenario is that the LASD would provide 2 units (ONE man patrol cars) for our entire city if a merger were to take place. Another possibility is that they would use the current police station as a "substation" IF needed. Keep in mind even though some people think we would be getting “constant” valuable resources such as K-9, SEB (SWAT), Aero, etc…, that THAT would not really be the case. For example, if something big were to happen let's say in the city of Rosemead (which is patrolled by TEM) and they would need deputies for a containment, they would (AND DO) use their "sister cars" from all the cities/unincorporated areas that TEM patrols....such as Temple City, Rosemead, South El Monte, Duarte, South San Gabriel and Unincorporated Pasadena/Monrovia counties. Usually when that happens it leaves the cities with limited to NO units patrolling their respective areas. I’m not saying that if something were to happen in Arcadia that the SMPD currently wouldn’t respond to assist, but at least SMPD would NOT have EXTENDED eta's (estimated times of arrival) back into the city. Just something to consider....the grass isn't always (TAN) and GREENer on the other side of the fence. Do you read palms as well? We pay for the helicopter already from Pasadena PD. Try telling the truth, 11:20. Although I know it's tough to admit the helicopter coverage is OUTSOURCED. Seems like the smartest thing to do is have the administration run somewhere else, require one detective to be assigned to Sierra Madre exclusively, but have him stationed at a place where he can utilize real resources to get his job done, and require 4 patrol guys and one dispatcher to be placed here at our station, be exclusive to us, and pay them 25% more than we are paying them now. In other words, the biggest cost is the smart people at the top, and those smart people don't have enough to do here. But the low guys on the totem pole have a lot to do, and we don't pay them much. Then if we need more, we utilize the pool of resources. Sounds great, 2:57. Hope that info makes its way to the council. I'll have what 2:57 is having. If we were a full service city, aka a "Buchanan Moran Walsh" city, we'd have our own helicopter. None of that tough guy stuff, fella. Here we have edifying conversations about the state of our municipal government and how it relates to the needs of the taxpayers and residents. I haven't seen any yes on UUT signs yet. Are people too embarrassed to put them out? Takes time to have them printed. They probably only started when they saw the No signs. Did everyone get the NO postcard? Bart and Nancy got ambushed. They don't have any signs, no postcard, and absentee ballots are going in the mail by the hundreds. Can we say FAILURE? They only listen to each other. It's an echo chamber and everything they hear ain't right. I got my NO postcard. Nice work! Thank you. Please vote no and tell five of your friends to vote "no" too. My guess is that the 25% tax hike crowd was very surprised to see "No" signs. Because you're supposed to give the City Mo' Money anytime they say they need it. They're smarter than you, don'tcha know. Two of us just covered more that 20 streets and not one yes on the UUT signs were to be seen anywhere. Maybe the Civility Party is waiting for the younger members to do it over the weekend. A blitzkrieg approach that requires a bit more fitness. They'll get put up at houses with Goss signs. Same old places we see that kind of stuff every election. I just unearthed Goss's card from a stack of unwanted junk mail. What a hypocrite! His first policy point is fiscal discipline! Where does the tax hike that you support figure in that, Mr. Goss? Another point - he's against "irresponsible development" at the monastery. So responsible development of every square inch up there would obviously be fine and dandy, and we all know developers are always responsible. Yeah, we'll, he also states on his web site that he won't take any money from unions or outside sources, but he is endorsed by a teachers' union and my guess is they probably gave him $500.00. How's that for honesty and integrity? City put a metered 48 cents on the envelope and sent it out, 22 cents short, so not only did they use your local tax money to send the fact sheet illegally, they stiffed the USPS out of the real cost of sending this over-stuffed envelope. Please hang on to that hot mess, it might come in handy if the feds get wind of this misappropriation of postage. I took my envelope with another sheet of paper inserted in place of the water bill to the Sierra Madre Post Office and asked the postal clerk what it would cost to send. He measured it on his scale grid, weighed it and told me: 70 cents! I knew it was heavier than a lst class postage stamp and you know that all the post delivery people did too. On his website, Goss' "pledges"..."my solemn commitment to fellow Sierra Madreans is that I will absolutely not solicit nor will I accept any support from political parties, outside political organizations, outside political interest groups, outside political consultants, labor unions, law firms, developers, etc." Goss solicited the endorsement of the United Teachers of Pasadena (as did every other candidate) and accepted their endorsement and placed it on his mail. If an endorsement isn't "support" what is it? Goss lied and broke his pledge and Goss is still lying because his "pledge" is still up on his website. Question.Since our population remains close to what it was in 1992;why has the Police department doubled in size? Because crime has doubled in size. So dumb it just had to be eliminated.